As a company with its roots firmly planted in the business of selling books, Barnes & Noble College has made an art of diversifying its product and service offerings to match customers’ changing needs and expectations. Throughout the company’s history, the retail experience gained through book-selling has been successfully leveraged into areas as diverse as technology, food service and snacks, and general merchandise. It’s exactly that part of the Barnes & Noble College reputation that attracted the attention of The Kellogg School of Management when they were looking for expertise in the development of a different kind of campus store. The Kellogg School of Management’s Donald P. Jacobs Center. Located on the shores of Lake Michigan, in Evanston, Illinois, The Kellogg School of Management is the business school of Northwestern University and is well-known for graduating world-class business leaders and for its own considerable reputation in the field of marketing. 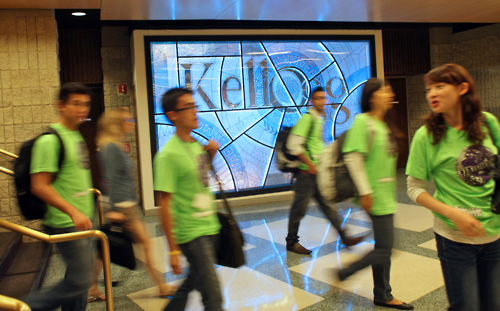 For some time, the school had been operating two Emporium stores – designed to serve graduate students at its Jacobs Center, and a hotel and conference facility at the Allen Center – with branded goods promoting the Kellogg name. Barnes & Noble College recently won the bid to manage both stores and assumed operation just last month. “The Emporium stores are a different kind of operation,” admits Jerry Jacobson, who manages both stores, together with the Norris Center Bookstore at the Northwestern University-Evanston campus. “But they’re also the kind of operation we understand well,” he adds. In addition to operating different opening hours to cater to the specific needs of their clientele, the Emporium stores also represent a different operation from the standpoint of merchandise selection; selling clothing, pens, sporting goods, umbrellas and other gear with the Kellogg logo. From the outset, it was clear to Jacobson that the stores represented more than just a retail opportunity for Kellogg. They represented a vital part of the institution’s branding. “It’s going well,” he says of the first month of operation. “We benefit from a huge amount of input from the Kellogg marketing team – and learn a lot about the school’s preferences and goals every day.” Jacobson sees his responsibilities as not only managing the correct operation of the stores, but also developing new merchandise opportunities for Kellogg. “We’ll balance our stock items with perhaps more high-end and prestigious gifts that faculty can use for guest authors, or speakers who visit the campus, and build more merchandise opportunities in other capacities,” he remarks. 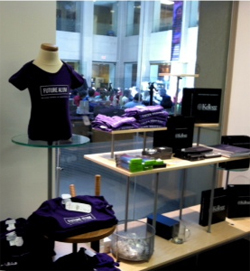 Kellogg-branded merchandise displayed in the Jacobs Center store. Another crucial aspect of the store’s development plan is to extend the Emporium’s reach to Kellogg’s wider audience of students and alumni. 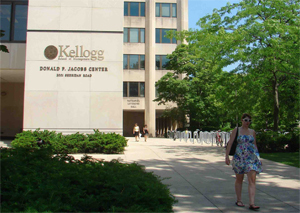 In addition to the Kellogg campus in Evanston, the school also operates additional sites in Chicago and Miami, while the Kellogg School Executive MBA program includes global partners as far flung as China, Hong Kong, Thailand, Singapore, India, Israel, France, Germany and Canada.